Family sessions are always a challenge because I have to get everyone to look at me at the same time with a great big smile. For families with children, this is an especially greater challenge. I often find myself "swapping heads", for lack of a better term, to get my shot just right. 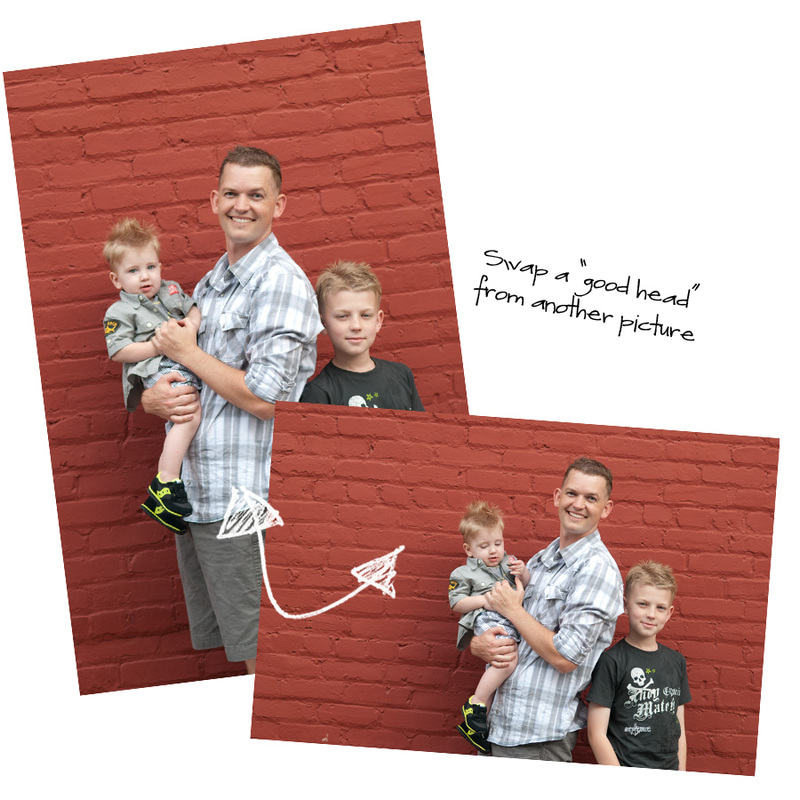 Creating a composite image is as simple as finding a base image and appropriate images to pull in outside objects or subjects and using a layer mask to merge the two. For this quick tutorial, I'll be using an image of the Hunt men from my session just this past weekend. Here is a straight out of the camera (SOOC) shot but unfortunately our little guy was looking at the rocks we were passing him to keep happy instead of the lady with the camera. This is an otherwise great shot, so I can't bear to part with it. Looking through my film, I find another image from this same pose where baby is looking at me. In my opinion, the key to a good head swap is making sure you use heads/subjects from the same location and same pose. If you start pulling from earlier/later in the session, your lighting and body position is not going to be the same, nor is the scale of the head/body. So now that I've found a better shot of our little guy, it's time to plop him into our base image. I use the lasso tool to draw a big selection around him. I find that drawing a big selection is a lot more fool proof when you are trying to blend (especially with a layer mask) then attempting a precise cut and paste. Once I've made my selection, I copy + paste onto the base, which creates a new layer. 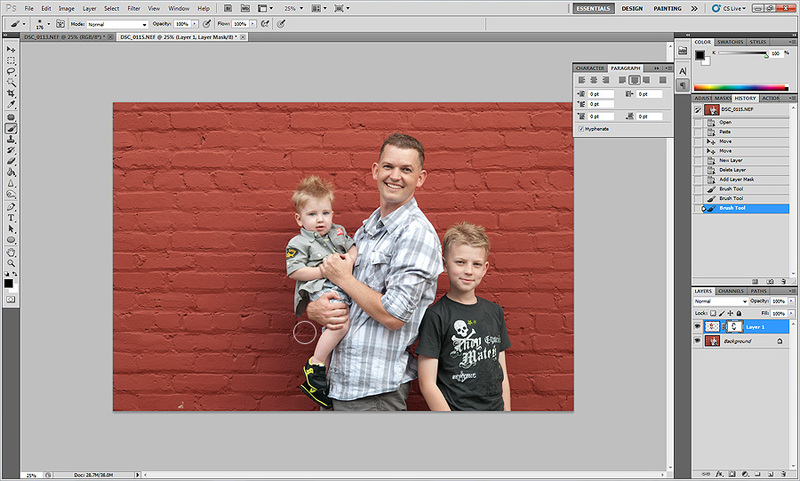 Now, using my Move Tool I adjust the layer to fit over the existing image. Having trouble? 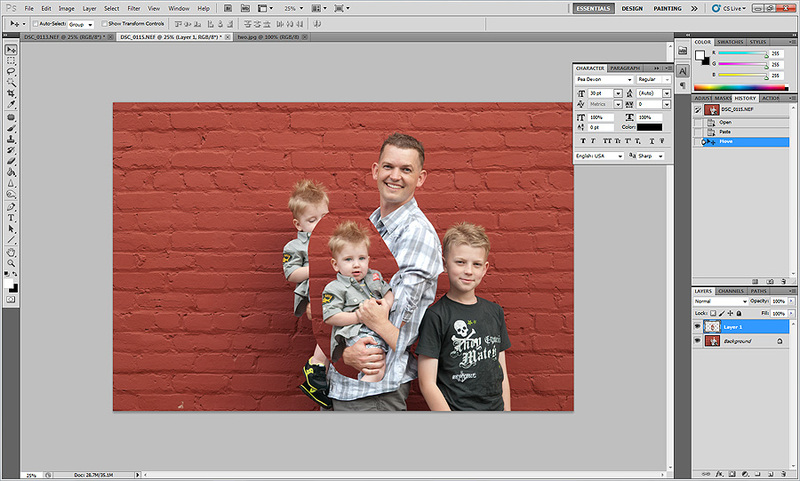 Try turning down the opacity of your pasted layer which will allow you to see the original image behind you. This can help you line up eyes, noses, etc. Just remember to turn the opacity back to 100% when you're done! This was a pretty seamless job, except that weird paste line on his leg and a few of the bricks look a big longer than they are in real life. This is when our layer mask comes into play! Layer masks - they are where it's at. I use them in every picture I edit! 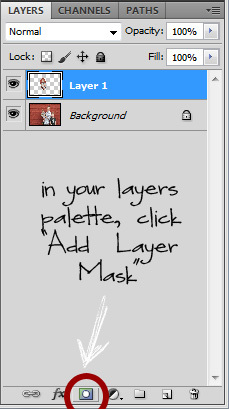 Make sure when you create your layer mask that the mask, or white box, is selected. It should do this by default, but ya never know. 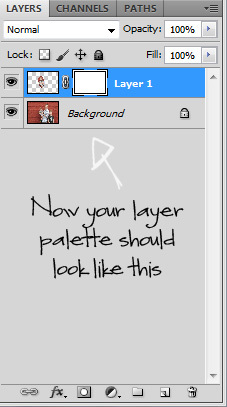 The way a layer mask works is by using a white and black paintbrush, you can draw and erase your layer as much or as little as you need. Black works more or less as an eraser while white paints back anything you've erased from the original layer. If you mess up, erase too far, or realize you needed a part of your pasted layer, you can simply switch your color swatch and repaint that part of the image. GENIUS. Since we want to remove the line of the pasted layer, we want to use a black paintbrush, to "erase" the pasted image. Doing this helps me clean up the excess brick around his head (thus making them proportional and well, normal looking) and I've cleaned up the area on his leg. Remember - if you make a mistake, simply switch back to your white paintbrush and add the pasted image back! 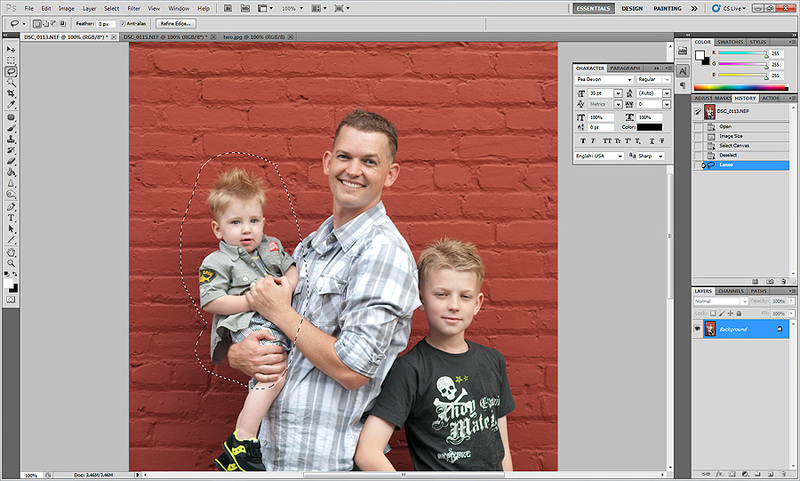 A layer mask is much more forgiving than simply erasing your layer or cropping out the excess. So there you have it! We saved this great image! 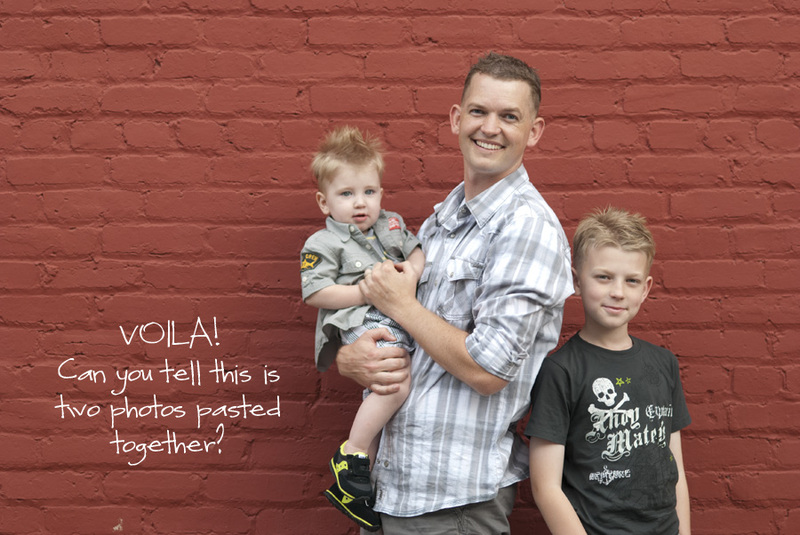 Once you flatten your image, the image should look seamless and no one will be the wiser. 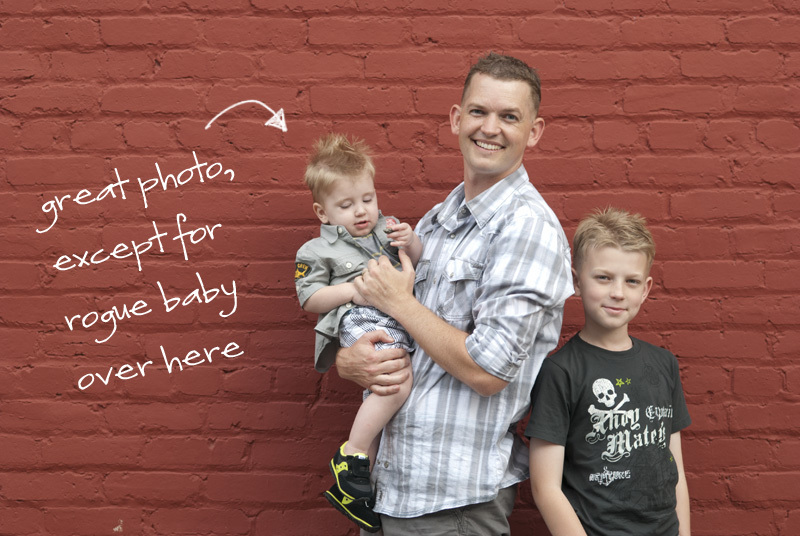 I had to do this for a few photos in this session and I think my clients would struggle to figure out which images have been adjusted! Check out the before and after by rolling over the image below to get the full effect! I just spent way too much time scrolling over to see the before and after. Awesome tutorial!